A triplet piano and some tasteful guitar licks introduce this first class effort from Mr Milton. He gives the song his full vocal strength and emotional commitment over a classic 12/8 deep soul arrangement - I love the out of tune horns in the background. That’s All I Need was cut in New York and certainly doesn’t sound as late as 1974 – the whole feel is a real throwback to the 60s. Experienced producer Clyde Wilson – who may well have had a slice of Interstate Records – holds the whole thing just about together, although the feeling that it all might collapse in a heap is part of this side’s considerable charm. 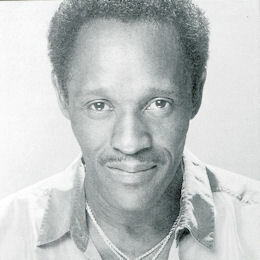 Milton was born on 5 October 1938 in Aliceville, AL and had a strong gospel upbringing. He moved to New York in 1963 earning his living in the clubs on Long Island. This 45 was his only release until he re-recorded it in the Big Apple in the late 90s, releasing it on Star Records first on cassette and then on a CD single. 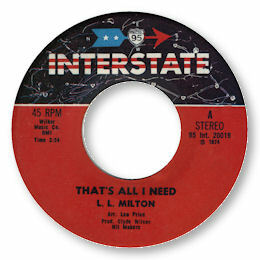 At this time Milton was living back home in Alabama and was leading a rhythm and blues band “Season To Please” touring in the state.